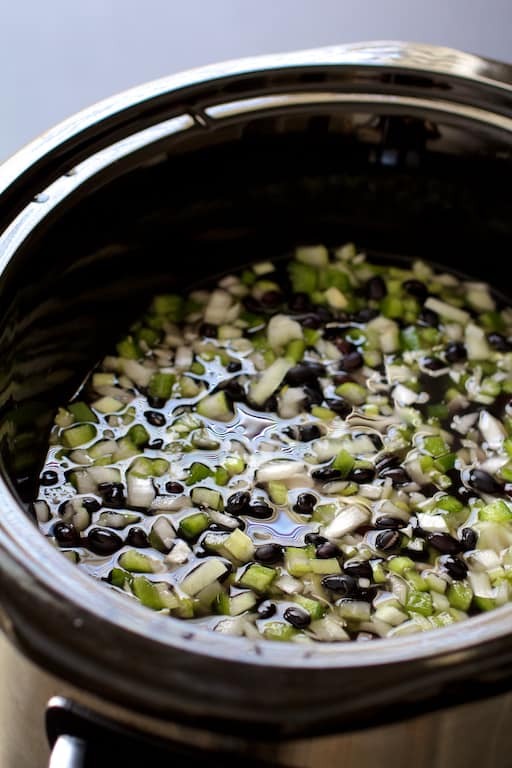 Slow Cooker Black Bean Soup with Ham is the perfect way to make black bean soup. My tips are guaranteed to get you tender beans every time! Our saga of frozen pipe water damage disarray continues! I don’t have to keep the house tidied up! Woohoo! Hubby brings mud in on his shoes? Who cares! The floor is going to get ripped out anyway. Dust on the furniture? Who cares! There’s going to be an insane amount of dust from ripping out the floor and putting in the new one. With all this chaos, it’s nice to do something simple like this Slow Cooker Black Bean Soup with Ham. Simply combine everything in a slow cooker and let it cook away! 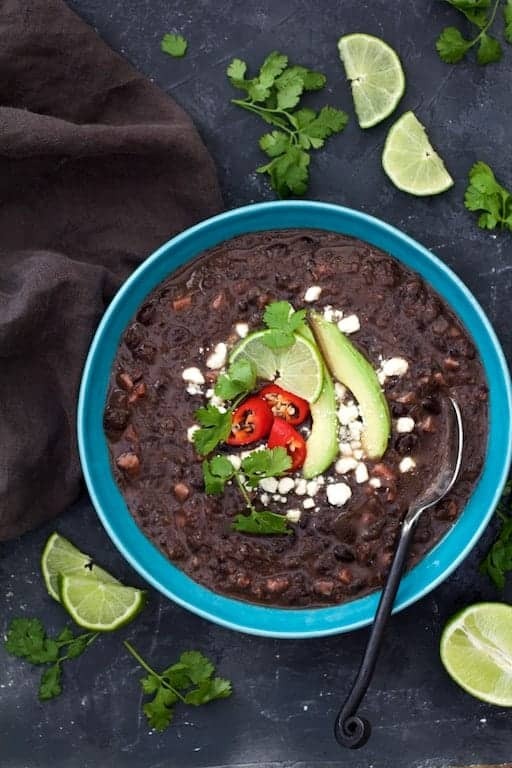 Now, I do realize I’ve been on somewhat of a black bean kick lately, but I love them and the cold months are when I’m going to do the most with them. Let’s talk about dried beans first. Have you ever been frustrated about why your dried beans WILL NOT get soft in your recipe no matter how long you cook them? Been there, my friend. Age of the beans. In other words, they’re old, expired… they’re history! Acid or alcohol is present. Soaking beans is optional. When time allows, I soak beans overnight in the refrigerator then discard the water. The other option is a “quick soak.” All that means is to place the beans in a saucepan of water, bring it to a boil, shut off the heat, cover and let stand for an hour. Afterward, discard the water. If you don’t soak beans, they’ll take a little longer to cook. An advantage to soaking is it reduces the digestive issues beans can create. (Ahem.) The epazote in this recipe is believed by ancient cultures to help with that, too. If you can’t find it, simply leave it out and adjust the other seasonings. After the soaking or quick soak, combine the beans, vegetables and seasonings (make sure the seasonings don’t contain salt) in plain old water in the slow cooker, cover and let it cook away. When the beans are tender, add cider vinegar for a pop of flavor, roasted chicken base (which is going to make up for not using broth or stock), salt and black pepper. Puree with an immersion blender until the soup is semi-smooth. Or, carefully process half of the soup in a food processor or blender then return it to the slow cooker. Add the ham and a drained and rinsed can of black beans. I add canned black beans because I like the extra “beaniness” and the added texture. If the soup is too thick, add a bit more water or broth and adjust the seasonings accordingly. That’s it! 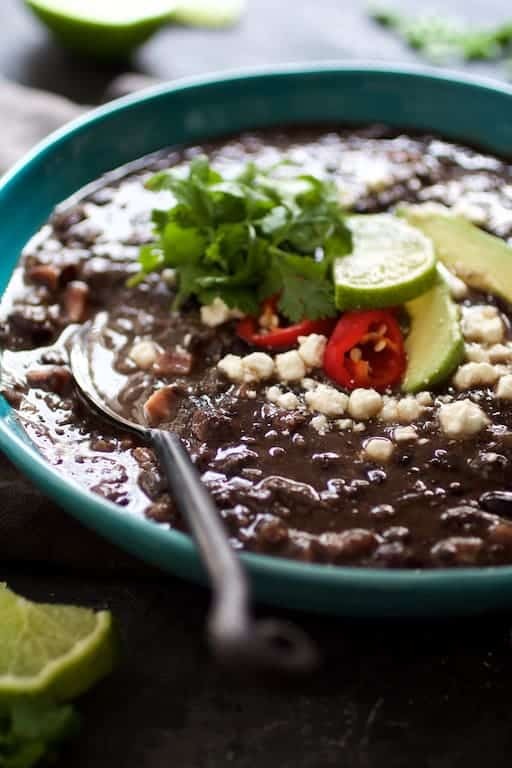 An amazing slow cooker black bean soup that’s low labor, high flavor and pure comfort! Add some fresh Fresno chiles, cilantro, avocado, goat cheese and squeeze of lime! Combine first 11 ingredients in a slow cooker. Cover and cook on High for 4 hours or Low for 8 hours. Add vinegar, roasted chicken base and salt and black pepper to taste. Working in batches, puree half the soup in a food processor blender. Better yet, use an immersion blender to coarsely puree. Add ham and canned black beans. Add additional water if soup is too thick. 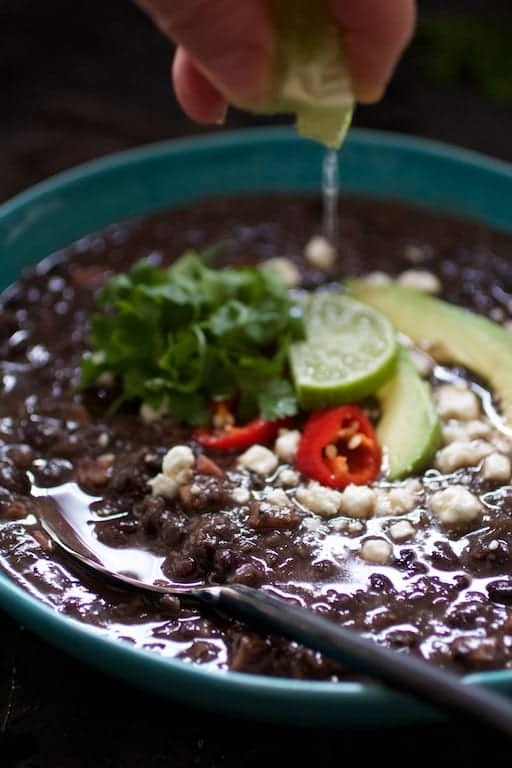 Serve in bowls garnished with chiles, avocado, cilantro and goat cheese. When I read this recipe I thought that it would be a great dish for a cold, poor weather day. I took the list of ingredients with me when I was out shopping this week on a 60º day here in New York! The forecast for the next day was a much cooler and snowy day. Turns out we got 11.5″ here in Queens. I set up the Slow Cooker with the pre-soaked beans and all the other needed ingredients and went about a day of paperwork and TV watching. Smelling the soup cook for 8 hours is near torture–the aroma is delicious. The soup is certainly the best Black Bean Soup I have ever made and among the best I have ever eaten. Make this soup…I promise you will not be disappointed! Thanx Carol, as with all of your recipes I’ve tried the flavors are perfectly balanced. Thank you so much, Jim! You’re awesome! Glad you enjoyed!